Hello loves! Don't think I'd forget about you right before Valentine's Day! Not even the busiest weeks in the world (literally, the busiest) could stop me. Speaking of busy, these last few days/weeks have been crazy. And they're only getting crazier. And unfortunately, Twentyapolis was put on the back-burner for a few days. But don't worry, it doesn't mean I love blogging any less! Quite the contrary, it makes me miss it more than ever. What have I been doing in the meantime...well, there's a very long post about that coming soon. One of the things I did? I made you a gift guide! 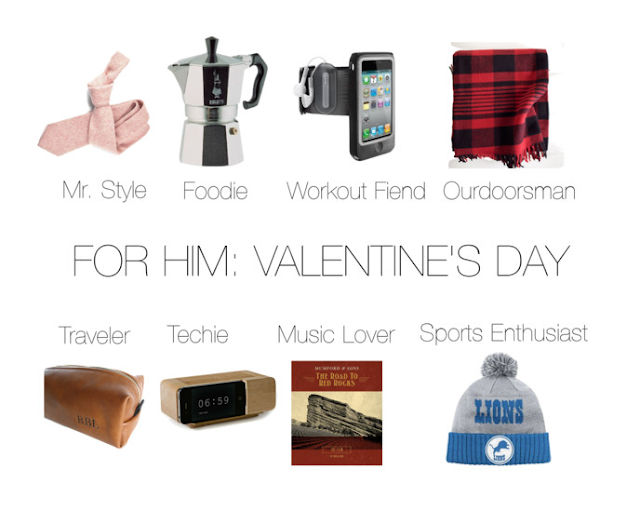 If you're still thinking of what to get your sweetie this Valentine's Day, here are a few last-minute ideas! Remember, there's always next-day shipping! For Mr. Style - I love that Jack likes style. It makes me feel comfortable buying him nice pieces for his wardrobe that will last years and years. And lately, I'm really into all things hyper-local, especially that wool Pierrepont Hicks tie. Pierrepont Hicks was created by a husband/wife duo with Minnesotan roots, and let me say, they know their ties. You just can't go wrong with something so stylish. For the foodie - If your guy is into caffeine (I like him already) and is somewhat of a foodie, a moka will be a great addition to his kitchen. It's useful and a little quirky. The best part? He'll actually use it. Espresso, anyone? For the workout fiend - An armband with earbud holders. A necessity for any gym rat. If he doesn't have one, he'll be happy you thought of it. For the outdoorsman - Camping season is coming up quick. If your guy likes camping, outdoor festivals or anything that takes place outdoors, a blanket from Faribault Woolen Mill is a great fit. Also hyper-local, Faribault offers durable blankets that are ridiculously warm and are made right here in Minnesota. For the traveler - I love dopp kits. They're so quintessentially...manly. And your guy probably needs and/or wants one. Especially this one. It's leather, and it's monogrammed. Score. For the techie - I don't consider myself a techie, but I actually want this alarm clock. All you have to do is set your phone atop the clock. Not only will it charge your phone, it looks like an old-school alarm clock. He'll love it. For the sports enthusiast - It's nice Valentine's Day comes right after the Superbowl. What does that mean for us girls shopping for our sports-obsessed boyfriends? SALES. On everything. Jerseys, hats, hoodies, you name it. Happy shopping! And chocolate eating. It's almost Valentine's Day. You deserve it.